One of the highlights of an eventful week in Washington (i.e. full of events!) 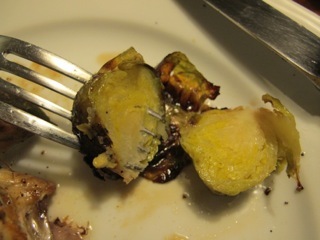 was the discovery of these unlikely little delicacies–roasted Brussel Sprouts. They are all the rage it seems. I didn’t need convincing, though I know this vegetable is controversial, often occasioning pursed lips. Those school meals again, I suspect, to blame for overcooking them to a mush. Our host, Iris–a fine cook–was already familiar with the technique and gave me the simple recipe. 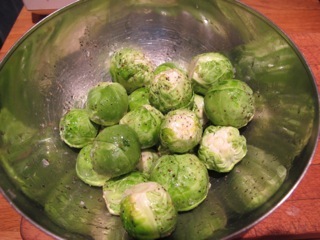 Place the sprouts in a bowl and add the olive oil, salt and pepper. Turn over to allow the oil to coat the sprouts thoroughly. Empty them onto an oiled sheet of foil spread over an oven tray. Place the tray on the middle shelf of the oven. Roast for 30 to 45 minutes–depending on their size–shaking the pan every ten minutes to brown them evenly. Reduce the heat if necessary to prevent them burning. They should be dark brown, almost black, when done but with a tender green interior. This works well for most vegetables, try it with slices of winter vegetables like parsnips and carrots and onions, and with summer ratatouille veg. Roasting all these makes them very sweet and tender inside, and a little chewy outside. Gotta rub in the olive oil and lots of herbs (like herbs de provence) and let them sit for at least an hour before roasting. We love Brussel Sprouts! Lovely with a bit of pancetta & balsamic vinegar! oh my giiddy aunt, two things I love brussels and burnt food YUUUUUUUUUUMY. Let me see, yes I have fresh brussels , AND olive oil and YES me thinks I will be making them tonight. Isn’t it funny them being all the rage, finally getting the attention is so deserves. I absolutely love brussels sprouts!!! Roasted, steamed, sauteed, love ’em! Will definitely try this recipe – thank you for sharing it! Well I had them for dinner, and they were delish, and I think I am going to have them for dinner tomorrow too 🙂 and I agree Susan, I LOVE parsnips roasted. I’m going to try these! 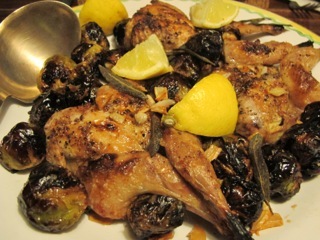 I’m that strange duck who has always loved brussel sprouts, and these sound delicious. Thanks again for coming through, Robin. Neil and I both like brussel sprouts but I never quite know what to do with them. Will definitely try this. Brussel sprouts get so much bad press I never thought I would see the day when they became the latest rage! 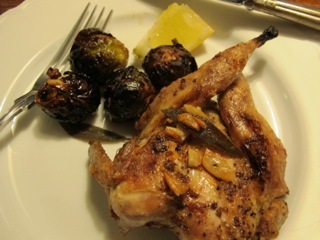 I’m always looking for different ways to cook brussels sprouts. We love them in our family – even my 9 year old son and my 5 year old daughter. We love your recipe for Brussels Sprouts and Shallots and now we’ll have to try this. Thank you again! This sounds like a wonderful way to cook brussel sprouts. I will try it very soon. Thanks for the recipe. I have been making this forever. Great taste and so easy to make too. 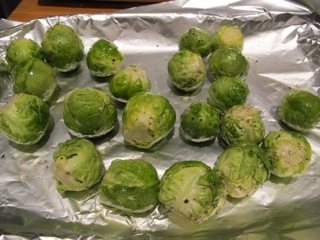 I’ve been getting brussels this winter in my co-op produce bin, and on days when I haven’t had time to roast them have discovered a really simple and delicious way to cook them. Wash and trim, cut in half unless they are very tiny, steam in a vegetable steamer until they turn bright green and you can just get a fork through one. They should still have a little bite. Put hot sprouts in a bowl, drizzle with walnut oil, squeeze over fresh lemon juice and add fresh ground sea salt and pepper to taste. A little Romano cheese grated over is a nice addition. So easy, and even good cold if you haven’t gobbled them all when they were hot. Thanks Deborah–sounds delicious. We have some Romano–nice and salty–and healthy walnut oil. Made these over the weekend. Another hit!! Delicious and even better the next day. I usually steam my brussel sprouts and we enjoy them but this recipe takes the sprouts to a new level.